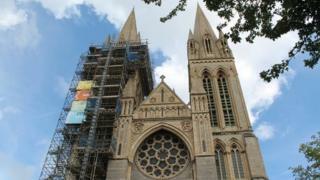 The Diocese of Truro is facing a shortfall of more than £1m in the next financial year, a bishop has said. It comes as new figures revealed Anglican churchgoers in Cornwall currently donate 20% less than those in any other diocese in England. People in the county give about £5.80 per week, compared with a national average of £8.40. The Bishop of St Germans said unless urgent action was taken, such a level of debt was unsustainable. The Right Reverend Chris Goldsmith said in a financial report: "If we continue to chase down declining income by reducing costs we risk an organisational death spiral from which it would be difficult to recover." The situation for the 2015/16 financial year had been developing for "several years", the bishop said. He said: "We can cover that for next year, but after that ...it would be irresponsible for that situation to continue." The diocese was consulting with the county's 12 deaneries - groups of between 10 and 20 churches - for suggestions, he added. "Rather than the diocese telling others what they should be doing, we want to hear what ideas they can come up with," Mr Goldsmith said. The bishop previously said the diocese was already "a low-cost operation" and that "we may already be under-investing in our churches and ministries". He said things to consider included encouraging more giving, helping to ensure giving was planned and tax efficient and looking at increasing the number of donations which were gift-aided.